Leather jacket, chaps and lined gloves – By the time winter ends, I’m so ready to ride that I’ve been known to get the bike out if temperatures get to 45. (That feels SO warm when you’ve been in the months-long deep freeze, but when moving through the wind it’s really quite chilly!) There are some who go by the mantra, “All the gear, all the time.” This means they wear full leathers (or armored textiles) on every ride. I can’t claim to be that protective, but I wear my leather jacket, chaps and lined gloves for anything under 55 degrees; and, the jacket and gloves for anything under 65. Solid-gripping, ankle-protecting footwear – I used to wear a really nice pair of HD boots that were comfy even for all-day wear. Their only disadvantage was that they were lace-up and a pain to put on. Then I acquired a pair of red Ariat cowboy boots with good rubber soles, which I adore. And recently, I acquired another pair of HD boots also with rubber sole, but this time they lace AND side-zip for easy-on/off. A side benefit of all these boots – for me, anyway – is that they all have some degree of higher heel, which puts me flat-footed on the bike when I might otherwise not be. What are the personal accessories you can’t live without? 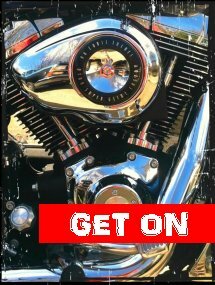 My E-book, GET ON, Now Available! Labor Day Sale: Free Shipping on ALL orders of $39.99 or more for non-Gold Club members at J&P Cycles . Offer valid through 09/05/17 at 11:59 PM EST. Shop now! Tips for Better, Safer Riding! Want to ask a question? 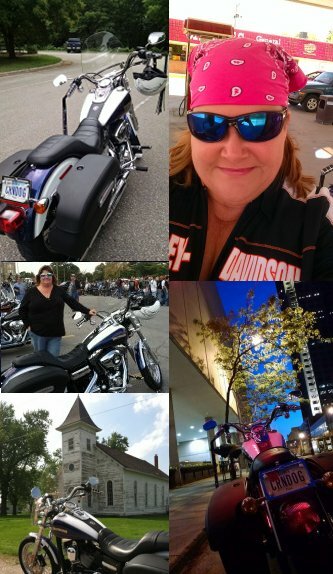 Feel free to drop me an email at janet@bikerchicknews.com!